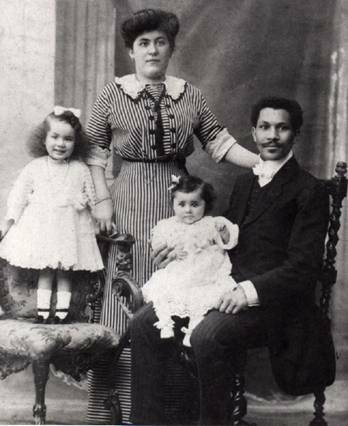 Joseph Phillipe Lemercier Laroche, the only passenger of known African ancestry who died on the Titanic, was born on May 26, 1889 in Cap Haiten, Haiti. He was the son of a white French army captain and a Haitian woman who was a descendant of Jean-Jacques Dessalines, the first ruler of independent Haiti. Laroche’s uncle, Dessalines M. Cincinnatus, was president of Haiti from 1911 to 1912. Joseph Laroche grew up among the privileged upper class in Haiti and received his early education from private tutors. Fluent in French and English, he decided on a career in engineering and at the age of 15 traveled to Beauvais, France with his teacher Monsignor Kersuzan, the Lord Bishop of Haiti, for his training. He attended classes in Beauvais and Lille, France, and received his certificate in engineering in 1907. Laroche married Juliette Marie Louise Lafargue, the daughter of a widowed Paris wine merchant in 1908. They had two daughters, Simonne, born on February 19, 1909, and Marie Louise, on July 2, 1910. Although Laroche worked briefly on the Paris Metro line, he had great difficulty finding and keeping a job in France due to racial discrimination. As a consequence the new family was forced to reside with Juliette’s father. Their youngest child, Marie Louise, had medical problems which also strained the family’s finances and by 1912 they were expecting a third child. This situation led Laroche to decide to return to Haiti where he believed his family’s political connections would guarantee a handsome income for his work. Laroche’s mother sent the family tickets to return to Haiti aboard the La France. However, the ocean liner’s policy banning children dining with their parents in the dining room led Laroche to exchange their first class tickets for the La France for second class tickets on the R.M.S. Titanic. On April 10, 1912, Laroche and his family boarded the Titanic from the harbor of Grande Rade near Fort de l’Quest. The Laroches enjoyed the opulent amenities of the ship, dining in the same dining room as its first-class passengers. However, they were subjected to stares and some insults from fellow passengers and crew who frowned upon their interracial marriage. After the sinking of the Titanic, the White Star Line extended a public apology for the racism exhibited by its crew members toward its non-white passengers including Laroche. As the ship sank in the early morning of April 15, Laroche stuffed the pockets of his coat with money and jewels and took his wife and children up to the boat deck. He wrapped the coat around his wife, and his last words to her were: "Here, take this, you are going to need it. I’ll get another boat. God be with you. I’ll see you in New York." Joseph Laroche died in the sinking of the Titanic. His body was never recovered. His wife Juliette returned to Paris with her daughters and gave birth to their son, Joseph Lemercier Laroche on December 17, 1912. Judith B. Geller, Women and Children First (New York: W.W. Norton & Company, Inc., 1998); James B. Clary, The Last True Story of Titanic (New York: Domham Books, 1998); Sabrina L. Miller, "Untold Story Of The Titanic," Chicago Tribune, February 20, 2000; Zondra Hughes, "What Happened To the Only Black Family On The Titanic," Ebony, June, 2000; http://www.titanic1.org.